Wow, just typing those words Aaron update 100 gave me the willies! Aaron weighed in this morning at 2650 grams, or 5.84 pounds. Hes doing just fine. The next couple of days are going to be a bit hectic, getting Aaron, Kathleen and me prepared for Aarons discharge on Wednesday. So far, were still on schedule, and it still looks like Wednesday will be the day. Before getting wrapped up in the busyness of the week, though, I thought Id spend a few minutes and try to gather my thoughts and sum things up; sort of swallow this past four months, at the end of this chapter one (The NICU Experience), before we begin chapter two (Home Life). Thanks again for putting up with me as I try to summarize and make sense out of these past four months. Im again in the waiting room on the fourth floor of CPMC, facing the big window that looks out over the city of San Francisco. Im sitting on the same couch that I was when I wrote about the first six weeks of our adventure, in update 24. Its not raining today; in fact, even though rain was forecast for the entire weekend, its bright and sunny outside. Thats pretty much how it feels right now. The past four months have been so crazy, that it must have been a dream! I could reiterate all the crazy stuff here, but you know most of it already; thats what the first 99 updates were about. You know, its funny. For months, Ive thought about what I would write in this update. Now, I feel as though Im just choking on all the ideas. There are too many of them, each one begging for more depth than I could give in this e-mail. Maybe I can at least touch on a couple of things, though. So, why did God allow this to happen? Generally, I accept Aarons troubles as simply part of life in this fallen human world. The rebellion of our first ancestors against our Creator, I believe, is the first, general cause of these difficulties. Probably all of you know the Biblical story (if not, let me know, and Ill happily talk your ears off about it). For me to explain, though, why God allows sin or evil to exist at all is a little beyond the scope of this e-mail, if not beyond the scope of my understanding. Specifically, though, why did God allow THIS to happen to US? I dont know. Im not so sure we can answer this question in this lifetime. However, Ive already seen an amazing amount of good come out of this challenge: people praying for us, God answering these prayers and keeping us afloat, people helping us with personal needs, doctors and nurses giving Aaron amazing, state-of-the-art medical care. Weve seen Aaron touching people already, encouraging them to evaluate their own lives, setting new priorities, helping them to appreciate and love their children a little more. Kathleen and I have acquired a new appreciation for the importance of friends and family. And, this challenge might even be helping to mold Kathleen and me into better people, better parents for Aaron, and people who are better able to love and serve God and our neighbors. Also, in the eternal scheme of things, we are convinced that God is working out all of these things for our good and to His glory. The Big Story isnt over yet, not by a long shot! Is this the most difficult thing that Ive ever been through? In one sense, yes; probably nothing else that Ive experienced so far in life has been as heart-wrenching as this. Although, for pure intensity, my leaving Jehovahs Witnesses about 19 years ago to follow Jesus comes close; these matters of eternal life and death were pretty intense for me (again, you can read that story at www.kevinquick.com/kkministries, if youre interested). In another sense, though, no; there was always the feeling of hope through this thing. Fear and anxiety, yes, but desperation or depression, no. In this sense, my job/third generation career loss a few years ago was considerably more difficult. The feelings of personal rejection and loss of identity and self-worth, which descended into a clinical depression, were much darker, over a longer period of time, than were those of these past four months. During our NICU adventure, there was always something to do, some progress being made, and some good thing to look forward to. Even though feeling severely twisted for a good part of the time, Kathleen and I always had mom and dad things to do to keep us occupied. We had a little boy to take care of. These things kept us going, and kept our chins up. OK, I think chapter one is done. Hallelujah! And, WHEW!! Now, were looking forward to starting chapter two this week. When will we be back to church? We would like to start attending regularly as soon as were back home, maybe one person at a time. (It looks like Aaron wont be able to come with us for six months or a year, though, unfortunately.) However, we still need to weigh the pros and cons of being fed spiritually and reconnecting with friends with the possibility of bringing home a bug that could make Aaron sick. So, were kind of up in the air on this right now. Alright, youve probably heard enough from me today, and I feel as though Ive gotten enough off of my chest. Thank you, all, for ALL of your love, prayers, e-mails, cards, letters, telephone calls, visits, food, cat and chicken feedings, and gifts over these past four months. Kathleen and I feel amply supplied, truly blessed, and READY TO GO HOME!! We cannot thank most of you adequately in this e-mail; well do our best to do that when we see you in person. 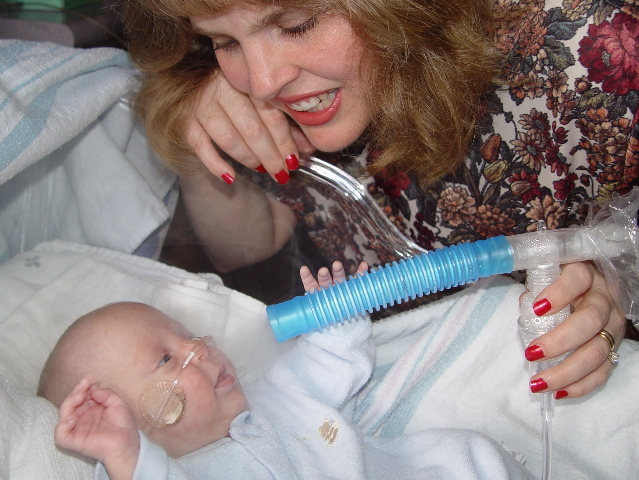 Heres a picture from this morning of Kathleen giving Aaron his lung treatment (a bronchial dilator) with a nebulizer. Well be continuing these treatments at home. God bless you, friends and family. OK, Lord... (deep breath)... bring on chapter two!